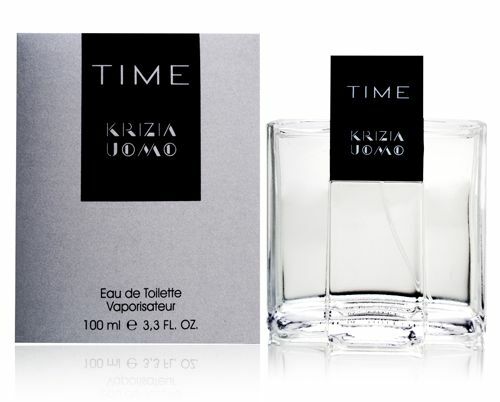 Krizia Time Uomo is a fragrance I bought a few years ago, and accidentally sold it on eBay in a big lot of about sixty bottles, having gotten lost in the shuffle of shipping it out. I haven't repurchased it since then but I should, since it's a pretty interesting take on violet leaf. When I first wore it, I thought it was boring, because it is very light. What I quickly learned was that Krizia Time is a fragrance that should be applied liberally, so that you can smell everything it has to offer. It's a dry, very diffuse and transparent fragrance where violet leaf is the star of the show. What makes it unique is how soft the violet leaf smells. Violet leaf usually gives a harsh, peppery green scent to fragrances. In Krizia Time, it's pale green and peppery, but not at all harsh. You can tell it's violet leaf for sure, but it's quiet, light, and ethereal, in a sort of "I'm not here" way. You'll also get some nice light whiffs of sharp spicy and woody notes floating in wisps around you during the day. It smells sort of like a softer, more diffuse version of Eau de Cartier. This makes an excellent fragrance for summer; I find it a little too light for fall or winter, because it lacks the kind of oomph I like for those times of the year. Some might find Krizia Time boring, due to how quiet it is. I find it fascinating and unique. It's really all subjective, so there's no such thing as a typical cold weather fragrance. For me, I usually mean heavy, rich orientals, often those that are sweet. I'm thinking of stuff like M7, Obsession For Men, Jacques Fath Pour L'Homme, or Gucci Pour Homme. Those are all good fragrances, but I find them much too oppressive to wear in warm weather. In the winter, they're great.